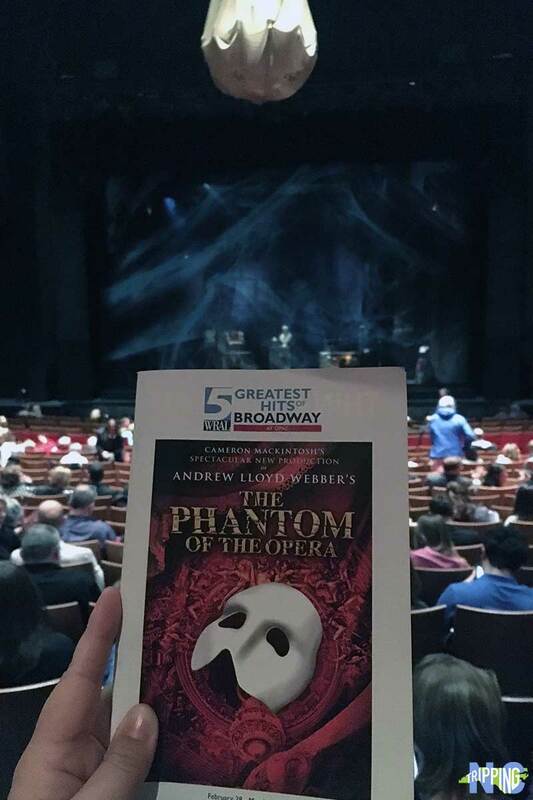 DPAC (Durham Performing Arts Center) is nestled in the center of Durham’s American Tobacco District and trust me—this is a venue that cannot be missed. It’s one of the best indoor things you can do while in the Bull City and it’s also recognized as one of the best in the US. However, there’s more to it than just being a great place to visit and be entertained. 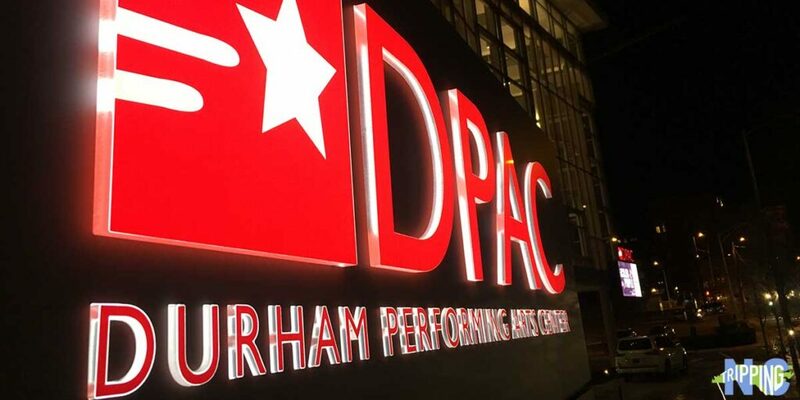 Let us take you through nine reasons we think you should spend time at DPAC and its surroundings in Durham, even though you already know you should! If you’re coming from out of town, why not spend a weekend in Durham? You can check out the best places to stay in Durham via TripAdvisor and Hotels.com. Personally, we’d recommend staying next to DPAC at Aloft Durham Downtown or The Durham Hotel a few blocks away. It’s so pretty on the outside! 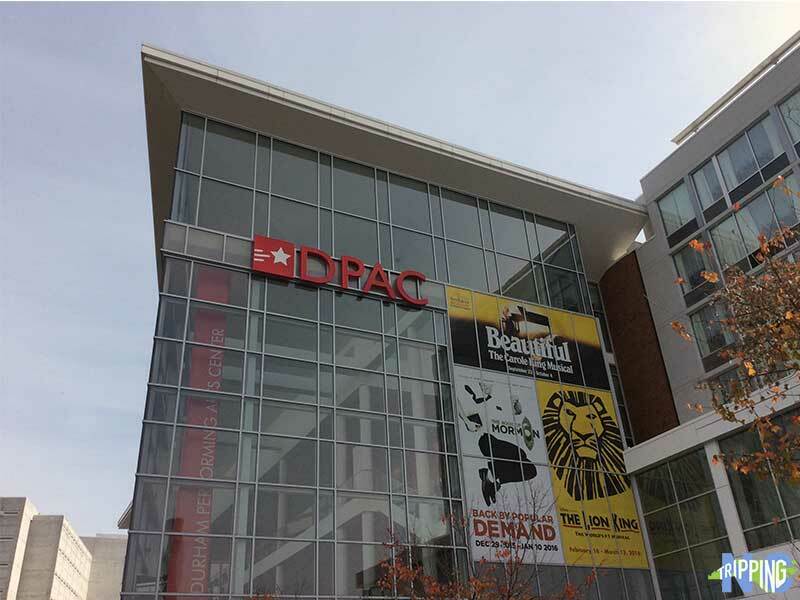 With 2,700 brand-new stadium-style seats, DPAC is currently ranked as the fourth-best theater in the US. 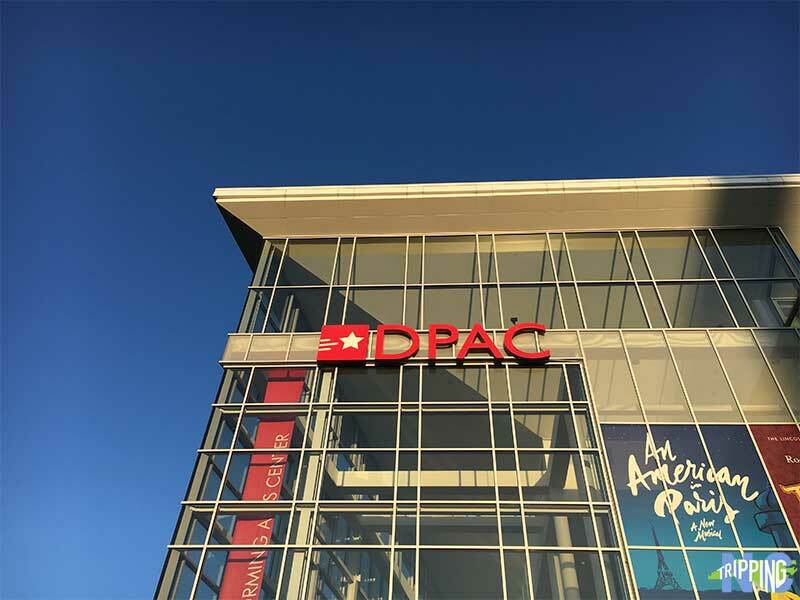 Shows at DPAC often fill up within hours of ticket’s being released, as Pollstar ranked them #2 in Attendance in the country. Selling out 130 performances during the 2017/2018 season is an indication that the people of Durham love DPAC. But unlike other venues, you never get the feeling like you’re jam-packed. 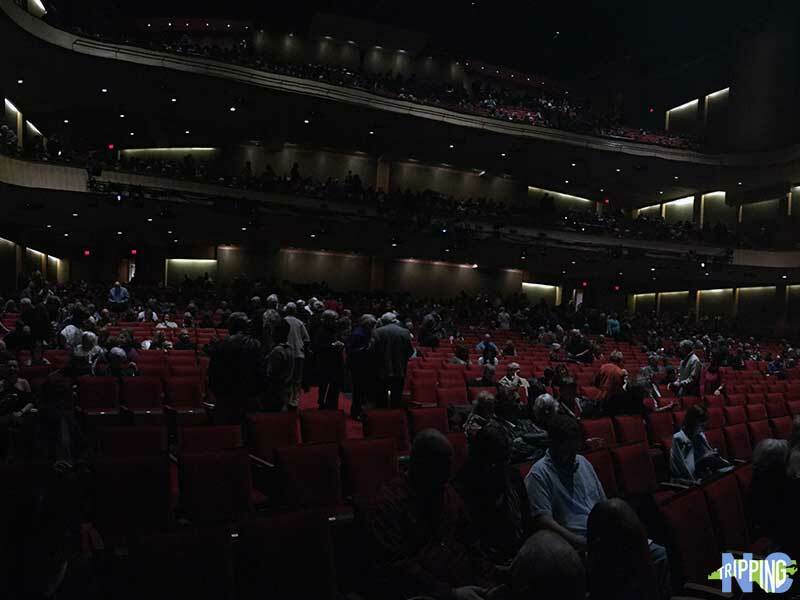 The views from every spot are wonderful, which have convinced us there’s really no such thing as a bad seat in DPAC. The staff know what they’re doing, from the parking lots to the stage, and are able to get everyone to their seats and back home without a hassle! Also very nice on the inside! With over 200 performances a year, it’s hard to keep up with all the performers who’ve come through DPAC. This diverse cast of acts proves there truly is something for everyone, too. If you’re into comedy, Jo Koy, Bill Maher, and Jerry Seinfeld are just a few of the names that come to mind. There isn’t a bad seat in the house to enjoy bands and songwriters like The Decemberists, Joan Baez, and Lyle Lovett. Then, there are the Broadway performances, such as The Book of Mormon, Cats, and the highly anticipated Hamilton, that will keep you humming and singing days later. By the way, DPAC season tickets are currently on a waitlist, but you can register and join the fun when they become available again! Did you know that DPAC participates in a Designated Driver Program? By signing up at the Guest Services window on the first floor’s entry lobby, those who pledge not to drink alcohol during the event can receive a complimentary fountain drink or bottled water. It’s fast and easy to sign up for the program and is definitely a win in my book! We like to arrive early so we can look around at this beautiful venue! Parking at DPAC is a breeze! With two huge parking garages next to the facility, it’s so easy to park and get home without a hassle. In total, you have five garages to choose from, that are within walking distance. We’ve left events at other venues early just to beat the crowd to get home to the babysitter, but not at DPAC. You breeze right through! We always park inside the American Tobacco East Deck off Mangum Street because it’s the most convenient for us. 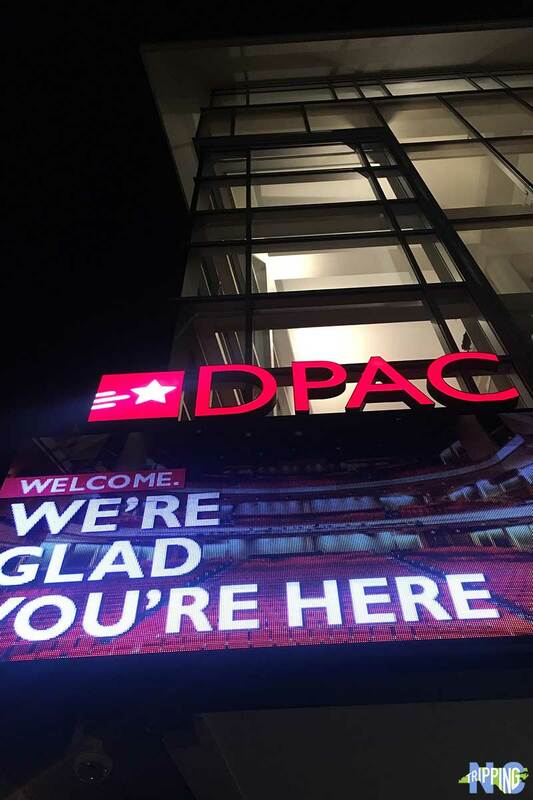 What’s your favorite way to get into DPAC if you’ve been before? Many of the best restaurants in Durham are close to DPAC. If you can get in, grab a pre-show meal at NanaSteak (Website/Facebook). Grab a custom cocktail there while dressed to the nine’s and make your evening extra special. 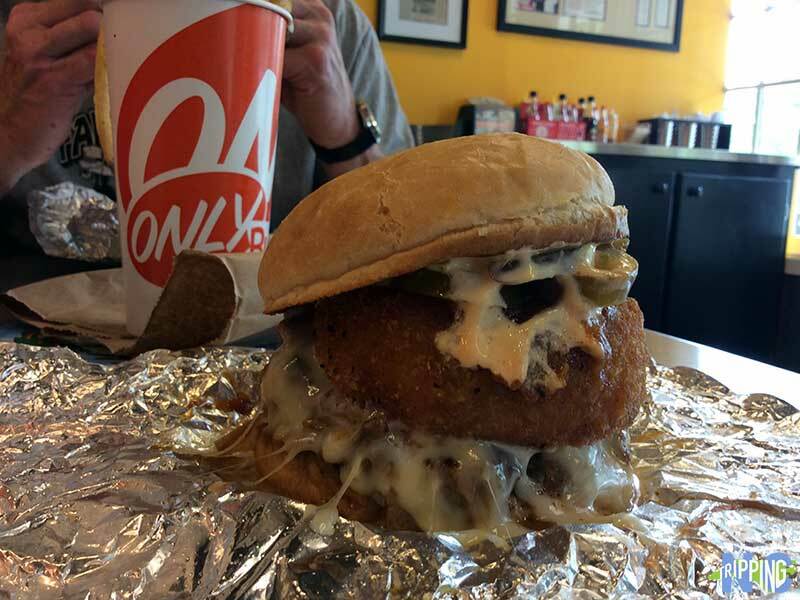 If you’d like something more low-key, then Only Burger (Website/Facebook) will help you out with their amazing creations. Tobacco Road Sports Cafe (Website/Facebook) is another cool spot and it also overlooks Durham Bulls Athletic Park (DBAP), which is a bonus during game nights. There’s also Tyler’s Taproom (Website/Facebook) and other fun spots inside the American Tobacco Campus. Grabbing a drink at W XYZ Bar. Connected to DPAC, the exquisitely placed and designed Aloft Downtown Durham is the perfect jumping-off point before exploring the Bull City and the rest of The Triangle. There’s an outdoor pool, indoor gym, and more fun amenities to enjoy while staying there. 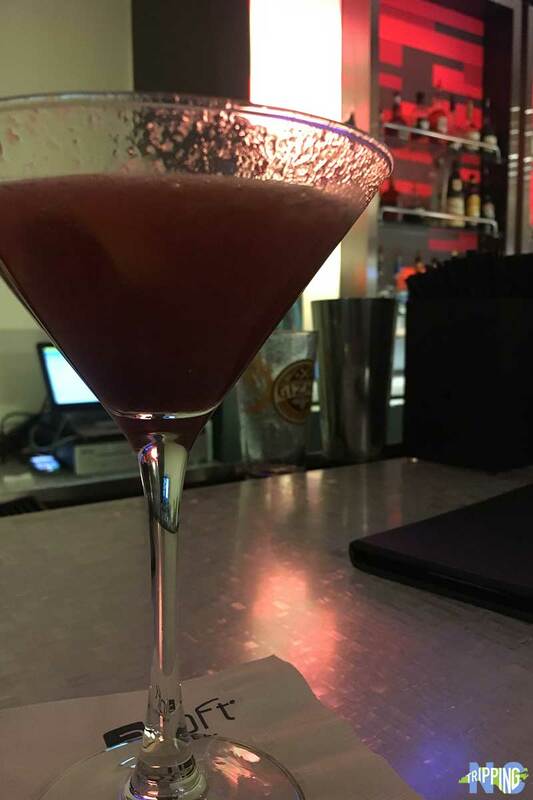 Even if you’re not staying at Aloft when attending a show at DPAC, the on-site W XYZ Bar serves drinks and delicious small plates! It’s a great spot before and after the show. Wanna guess what show we might be about to see? While DPAC does host a lot of huge Broadway and international entertainment performances, it is also a space used by locals for entertaining. Sip+Savor, Bull City Food and Beer Experience, and Nashville Songwriters at DPAC have performed special events and raised nearly $40,000 for local Durham non-profit organizations. Triangle Rising Stars is a fun competition where 40 school and 150 students participate to showcase their talents. We also mentioned DPAC in our Moogfest Preview, since that awesome Music and Tech festival holds some events there. “Heart of the Arts,” a community outreach program, has been connecting shows and audiences since 2008. This program brings professional theater and Durham students together and gives them many opportunities to learn from the best. 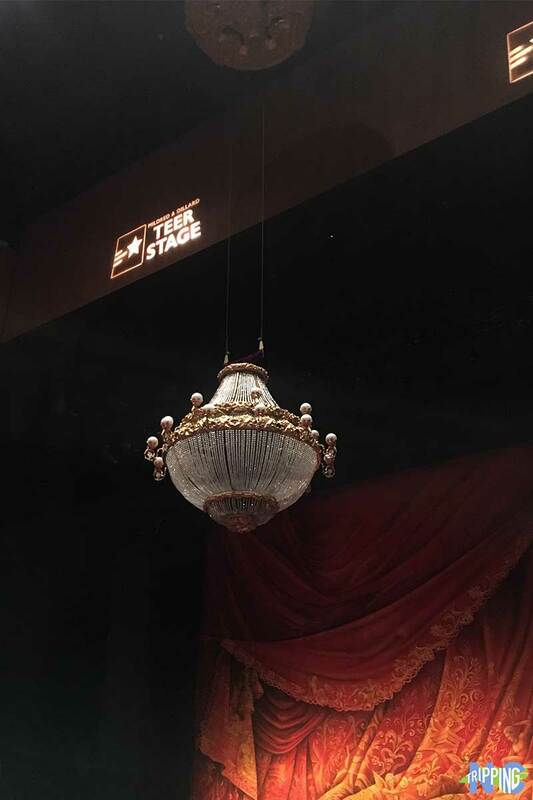 It’s a great program that includes master classes, backstage tours, post-show discussions, and orchestra rehearsals. If you’ve taken advantage of this opportunity or a similar one, what did you think of it? How do you think this type of thing impacts everyone involved? One last photo of the outside. This won’t be our last forever, though! Didn’t plan ahead for your favorite act, or are you looking for something to do with a night free? Don’t worry! 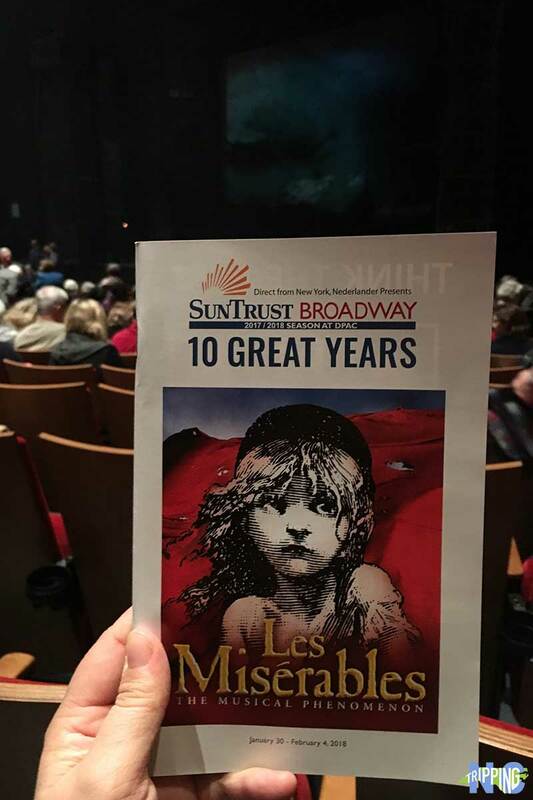 DPAC holds a limited number of rush tickets for most Broadway performances. For $20-30, you can still snag a seat without having to plan months in advance. I wouldn’t recommend always doing this, but hey, it’s always worth a shot to see if you can enjoy a night out at the last minute. It’s obvious that we love DPAC and can’t wait for the next time that we get to visit this awesome venue. Have you ever been? If not, is there anything as awesome as this place where you live? We’d love to know about it and might even go check it out someday! This guide is part of our series on Durham Travel and Places to Visit in North Carolina. It was originally created on July 30, 2018. It has been maintained and updated on our blog (as of December 29, 2018) to reflect current viewpoints and travel trends. This entry was posted in Travel and tagged DPAC, Durham, Durham County.